The founder of Modern Physiology was born at Berne. 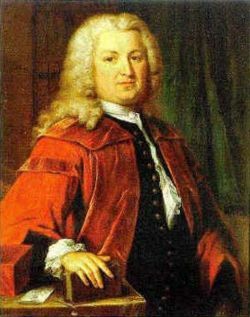 In 1723 he went to Tübingen to study medicine, afterwards to Leyden, where the famous Boerhaave was at the height of his reputation. Twelve years later he received the appointment of physician to the hospital at Berne; but soon afterwards he was invited by George II., as elector of Hanover to accept the professorship of anatomy and surgery at the University of Göttingen. His scientific writings are extraordinarily numerous. From 1727 to 1777 he published nealry 200 treatises. His great work is his Elements of the Physiology of the Human Body (in Latin), 1757-1776 - the most important treatise on medical science - or at least on anatomy and surgery - up to that time produced. The Icones Anatomicœ ("Anatomical Figures") is "a marvellously accurate, well-engraved representation of the principal organs of the human body." His writings are marked by unusual clearness of meaning, as well as by accurate and deep research. We wish we could here stop; but the force of truth compels us to affirm that, for us at least, his reputation, great as it is in science, has been for ever tarnished by his sacrifices - with frightful torture - of innocent victims on the altars of a selfish and sanguinary science.